By supporting ACS, you are helping touch and change the future, one child at a time. Local businesses join with parents, staff, and friends of Albany Christian School in raising money through various programs. Although the programs vary, all ultimately are focused on supporting ACS. simply by shopping. 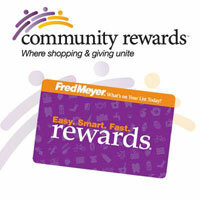 Register your card by clicking here or browse to http://www.fredmeyer.com. Albany Christian School has partnered with Goodshop.com to bring you terrific coupons and deals while helping us promote programs that prepare our students to excel in the future! Whenever you purchase from any of Goodshop's 5,000+ featured retailers, a donation will be made to us - at no cost to you. You get deals when you shop for supplies at Walmart, appliances at Sears, art supplies at Michaels and products from the Apple Store, including thousands more! Helping us is easy; register, choose our cause, and save money while helping us do good! Albany Christian School is now registered with Amazon as a charity under Willamette Community Church. Click on the link below and choose start shopping . Thank you for Supporting ACS. Click to get started using smilematic, this will automatically take you to Amazonsmile whenever you are shopping on Amazon.